Hereditary Fructose Intolerance is a rare genetic disorder and inherited as an autosomal recessive trait. Mutations in the gene for the enzyme fructose-1-phosphat aldolase (aldolase B) are causing an inactive form of the enzyme. Patients with inactive aldolase B enzyme show strong accumulation of fructose-1-phosphate and fructose-1,6-bisphosphat in liver, kidney and intestine resulting in intoxication. Until now there are described about 35 mutations which are inactivating. About 95% of aldolase B deficiency are caused by the four mutations A149P, A174D, N334K and Δ4E4. 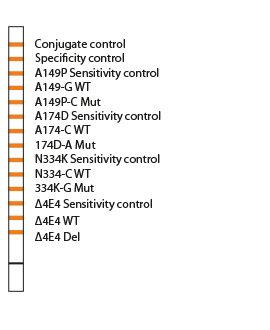 AID Fructose-Intolerance Kit enables detection of the four most frequent mutations in aldolase B gene.